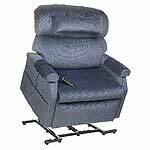 Bariatric lift chairs are heavy duty lift chairs designed for people with weights exceeding 300 lbs or 136 kgs. These chairs often have multiple motors and are manufactured in several sizes. 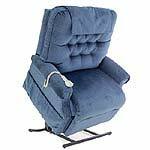 The Golden Tech Comforter Extra Wide Heavy Duty lift chair offers a 500 pound weight capacity,the ability to recline to a napping position,and the choice of Medium (PR501M26D), Large (PR501L26D)and Tall (PR501T28D) sizes. 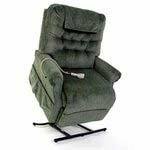 With a 700 pound weight capacity, triple motors and 33"" of comfortable space between the arms, this lift chair is the highest weight capacity lift chair that we carry. In addition, the triple motors allow for separate operaton of the footrest and the back for complete flexibility in achieving an infinite number of positions. The Pride Gentle Lift Line GL-545 3-Position Heavy Duty Lift Chair is a bariatric chair that provides unmatched comfort for the larger individual. 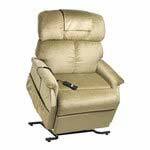 The GL-545 features increased weight capacity up to 500lbs, a seat width of 26,"" high-density REFLEX Foam in the seat and chaise pad for excellent durability. The Gentle Lift Line GL-555 2-Position Heavy Duty Lift Chair is a bariatric chair that provides unmatched comfort for the larger individual.This heavy-duty lift chair features an increased weight capacity up to 600lbs and a seat width of 30".